He is the pop brat that has been under the public spotlight for what feels like an eternity but at the ripe old age of 19, Justin Bieber is still no wiser. Bieber is reportedly facing prosecution after he sneaked a capuchin monkey, which he bought as a pet, onto his private jet as he flew from LA to Munich last week. 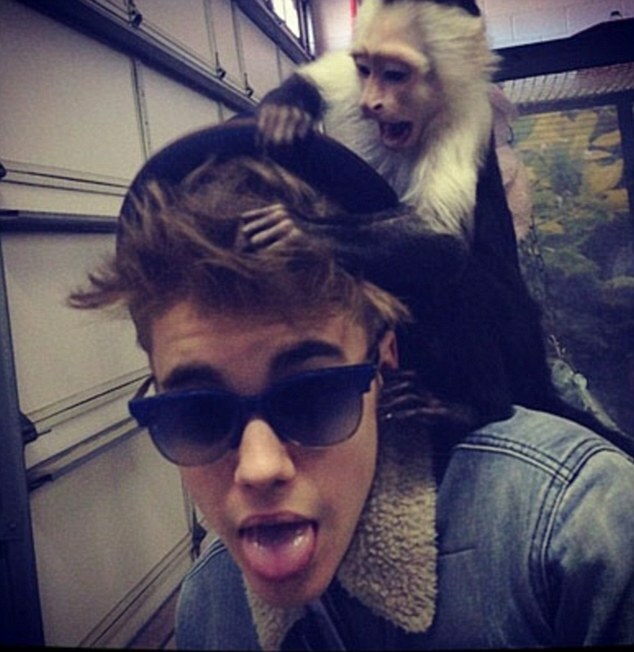 The primate, named Mally, was seized by customs and put into quarantine after the singer was detained for “some time”. Prosecution is a loose term for the rich and famous. Bieber will probably be slapped with a fine and the primate will be returned to him. Poor Mally will now have a lifetime of misery. When he reaches sexual maturity (the monkey that is) and becomes “unmanageable” he’ll probably end up in a sanctuary if he’s lucky or sold to someone else who’ll stuff him in a cage. When are the rich and famous going to learn that primates are not suitable as pets?? Whether they be monkeys or apes, they are not bred for domestication and they are meant to live in large social groups with their own kind. Bubbles – the late Michael Jackson‘s pet chimpanzee suffered a similar fate. He was born in a biomedical lab, taken from his mother and sold to a Hollywood trainer while still an infant. The King of Pop bought the chimp and by the time he was 4 years old he was “moonwalking” for the press, appearing in music videos, films and television programs. But by age 7 he was too strong to be around people and ended up at California’s animal compound before being moved to the Center for Great Apes in 2005. He has been late for concern dates; boo-ed off stage; dumped by girlfriend Selena Gomez after allegedly being unfaithful several times. Had a lawsuit filed against him from a security guard claiming $420,000 in unpaid wages and assault. He was turned away from London’s Cirque Du Soir after he arrived with underage friends. And in February, he was snubbed by Manchester nightclub Sankeys as they didn’t want him to tarnish their edgy image. Well I suppose that makes it all ok then. Bubbles is retired and effectively forgotten about, so the question is, what will happen to Mally when Bieber decides he’s also too difficult to manage? concern for anything they can just buy.